The Curiosity Rover took this composite self-portrait in the Rocknest sand patch on Mars. Tests of soil at the site suggest that troublesome chemicals called perchlorates are common on the Red Planet. TORONTO — Water. Blueberries. Lakes. Mountains. As Jim Bell described huge picture "postcards" late last month here at the Toronto Science Festival, for a moment it looked like highlights from a summer vacation. The pictures, though, were alien vistas seen through the eyes of NASA's Curiosity, Spirit and Opportunity rovers on Mars. Bell is an astronomer and planetary scientist at Arizona State University who specializes in rover imaging systems. This makes him one of the few interplanetary photographers in the world, despite having his feet firmly planted on Earth. "It's an inhospitable environment to live in, as we know it," he added. "You would need to bring oxygen. You would need to bring a spacesuit. Mars would try to kill you in so many different ways, if you go there, and it would probably succeed." Although Bell's pictures were originally taken for scientific use, some of them transcended that original purpose, he said. He flashed a picture of the Opportunity rover casting a long shadow late in the Martian day, or sol. "This is Opportunity pretending she's a monster truck," he said, eliciting a laugh from the audience of several hundred people. Bell is the lead scientist for the Pancam color imaging system on the Mars Exploration Rovers (Spirit and Opportunity) and co-investigator for Curiosity's workhorse Mastcam camera. Through the eyes of these sentinels, he's seen plenty of evidence of past water on Mars: rocks carried by ancient creeks, small hematite "blueberries," and plenty of "squiggly line science" (or spectroscopy) showing minerals created in ancient water. Signs of Martian life itself, though, remain elusive. "We haven't found any Martian organic molecules, but we have for the first time the capability to make that measurement," Bell said. "Was Mars inhabitable? Maybe it's unlikely we find some amazing biologic signal, but maybe it will happen. Who knows? It's exciting to think that we do that every day." Jim Bell, an astronomer and planetary scientist at Arizona State Unviersity, speaking at the Toronto Science Festival. Bell made repeated references to the longevity of the Mars Exploration Rovers. Spirit lasted six Earth years after its landing in January 2004, and Opportunity will mark a decade of Red Planet operations in January 2014. Each rover's mission was originally designed to last just 90 days. He flashed a picture of Spirit's view shortly after landing in January 2004. "We saw these mountains and said, 'They're pretty, but oh well, too bad, we'll never get there.' We never imagined we'd be cresting this one and going to the other side." Opportunity is still in reasonably good health, with Bell citing only its dusty solar panels as a potential near-term threat to its mission. 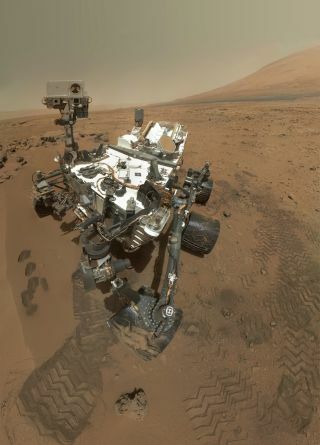 Meanwhile, the car-size Curiosity rover, which landed in August 2012, is about 60 per cent into its two-year prime mission on Mars, he said. NASA's next rover to Mars is expected to leave Earth in 2020. Bell called the yet-unnamed machine a "Curiosity clone," but with different instruments on board that could include the capability to collect samples for eventual return to Earth.